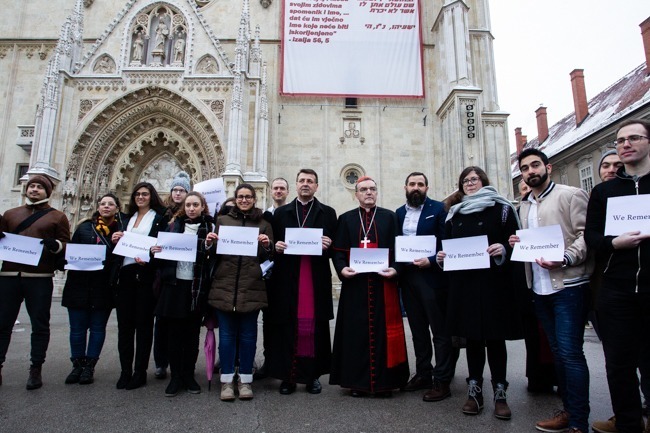 NEW YORK – “The World Jewish Congress deeply welcomes the powerful commemoration held by the Catholic Church of Croatia last week in honor of the victims of the Holocaust and is emboldened by the strong address delivered by Cardinal Josip Bozanić, Archbishop of Zagreb, in which he declared it unacceptable to permit the reemergence of antisemitism,” said WJC CEO and Executive Vice President Robert Singer. “In the 74 years since the end of the Holocaust, the Jewish world has been duly concerned by the Catholic Church of Croatia’s glorification of Ustasha nationalists and the horrific crimes that they carried out in collaboration with the Nazis, and by its repeated tendencies to whitewash the tragedy endured by the Jewish community and other minorities during World War II,” Singer said. “The official commemoration held on 24 January at the Cathedral of Zagreb is without a doubt an encouraging and almost miraculous step forward by the Church in addressing the darkest moments of its history, something that the Jewish community of Croatia has been waiting for more than seven decades,” Singer added. “We thank the Catholic Church of Croatia for this unprecedented move, and hope that it is the start to a new era for Holocaust memory and the fight against antisemitism in the country,” Singer added.